Organisational Membership of ALT is open to any organisation or institution with an interest in promoting best practice and research in Learning Technology. Organisational Membership begins at £204: http://go.alt.ac.uk/OrganisationalMembership. Membership benefits are outlined at https://www.alt.ac.uk/membership/membership-benefits. Contact membership@alt.ac.uk if you would like further information. Member organisations nominate an individual to maintain the membership and promote membership opportunities within their organisation. There is an informal meet-up for Organisational representatives at the ALT Annual Conference each September - come along to connect with colleagues in other institutions. Further information will be found in the Conference Programme and Guide. Founded in 1993, the Association for Learning Technology (ALT) is a Charitable Incorporated Organisation (CIO), registered charity number 1160039, and the UK's leading membership organisation in the Learning Technology field. ALT’s purpose is to ensure that the use of Learning Technology is effective and efficient, informed by research and practice, and grounded in an understanding of the underlying technologies, their capabilities, and the contexts in which they are used. Learning Technology is defined as the broad range of communication, information and related technologies that can be used to support learning, teaching, and assessment. We do this by bringing together practitioners, researchers, and policy makers in Learning Technology to improve practice, promote research, and influence policy. More details about ALT can be found here: https://www.alt.ac.uk/about-alt; or read the latest news and views on the #ALTC Blog. 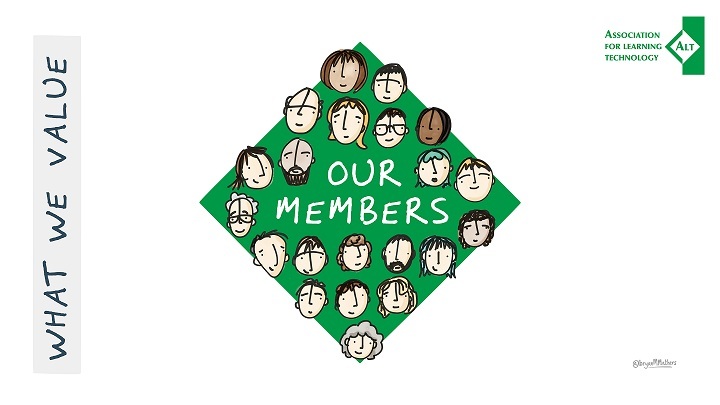 All employees of Organisational Members of ALT are entitled to a free Associate Membership, providing individual access to member services, including members-only lists and discounted event fees. Get in touch with ALT at membership@alt.ac.uk if you have any questions. The ALT Annual Conference is the UK's main conference for Learning Technologists and one of the largest conferences of its kind. It is held over three days every September, providing a valuable and practical forum for practitioners, researchers, managers and policy-makers from education and industry to solve problems, explore, reflect, influence and learn. ALT offers a peer-based professional accreditation scheme for individuals whose work involves Learning Technology - Certified Membership of the Association for Learning Technology (CMALT). Discounts are available for group registrations from organisational members. Disclaimer: This information is correct in February 2019, but please double-check against the ALT website, www.alt.ac.uk, for current information.